Heather returned to the states, her father ill with cancer. Alone and bored, I remained in London to finish my final year at Goldsmiths. From the sleep of childhood and all its aimless memories, an old computer game returned to haunt me. My first recollection wasy a flashback at the airport, triggered by a scent: the same carpet deodorizer my mother used to use when I was a kid. Transported away from the echoes of Heathrow's PA system and the hubbub of waiting travelers, I found myself back in my old bedroom. A child sat at at the machine, intent on the controls. Deja vu crept over me. Pixels shone like gemstones in darkness. Phosphors moved over the face of the deep and formed into random landscapes. Every play was different, a 64Kb window onto a universe of iterations. Music, naked square waves, rang out. I'd forgotten that place for a decade, but it had not forgotten me. In the blackness of the monitor's glass, I caught my younger self's eye; a chill tightened my skin and I was back in the airport terminal, staring at the contrails of my fiancée's flight home. In the days and weeks after, old neurons warmed like dusty lamps. I tried to look it up on the internet, but the game's name escaped me: this point of frustration, perhaps, helped turn curiosity into obsession. Weird memories crept into my daydreams. Sometimes these were vivid, declaring themselves the lost foundations of my personal mythology. Others were so evasive as to seem like tricks of the mind's eye, the subsconscious inventing internal unities at the final threshold of adolescence. The oddest thing was that as a youngster, I'd hardly cared for the thing. It was just one of dozens borrowed from someone or other and copied on the double tape deck, the act of piracy its own transgressive reward. Here's what I remembered of the scenario: a deposed king, stricken by amnesia, wandered the Orient in search of his former life. The genre was graphic adventure, each scene a single picture surrounded by the words--"get," "move," "look," and so on--that one could select to take actions. 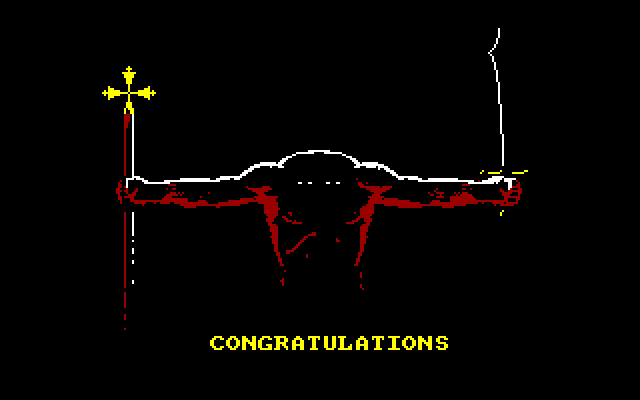 Most haunting of all was the game's final stumper, in a place called the Garden of Cyrus, before a huge gate embellished with a giant cross. Though the game's ruins and cities were different with each play, progress past this certain point was always impossible. Beyond it was a chapel. This was the final location, and within it lay the secret of the protagonist's identity. Between study all-nighters, my Pentium II, armed with Amstrad CPC emulation software, powered through dozens of downloaded candidates as the hunt went on. Though I still had the original hardware, back at my parents' place, my tape collection was discarded long ago. 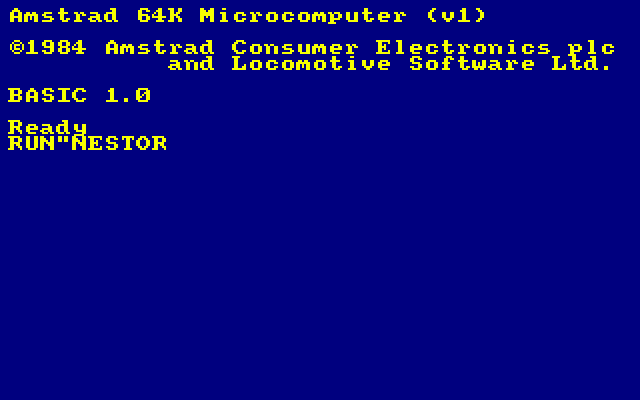 The main discussion group of the day, comp.sys.amstrad.8bit, was no help. I eventually got a bite on a web-based forum (cpc464.com, or perhaps CPC Zone) with a livelier community. "Can you name this game?" is an irksome way of introducing oneself to a retrogaming forum, but the regulars there were tolerant and helpful. And within hours of my first post, I had replies. "That is definitely Kobayashi Naru, by Mastertronic," one respondent wrote, followed by others' agreement. "Venom," offered another. The matter seemed solved, one way or the other. 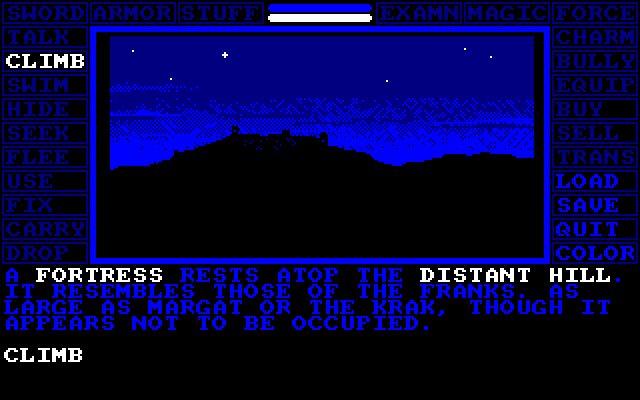 But the latter title lacked the randomized world, the garden, the gate, and the story I remembered. The other game's controls were visual icons, not words. Disappointed, I returned to the forum. Further requests gathered recommendations for titles I'd already discounted-- except one, from the same guy who suggested Venom. "Eastern Cross? I remember something like that in an old Amstrad mag," he wrote. The name struck a bell, sent me into a dream: my old room again, as if to verify it. My bedclothes were black and red; on the wall was a painting of an Iguanadon, the corners flat against globs of adhesive tack, signed ROBERT 1984 with a big copyright symbol. "I'm pretty sure that's your game. I don't have a scanner, so give me your address and I'll post you a copy when I get a chance to dig it out." Two weeks later, a large package, stuffed with newspaper clippings and magazines, arrived at my apartment in South London. Oddly, there was no return address. I thanked him on the forum, but got no reply. In fact, I don't think I saw another message from him again. Given what happened later, I can't help but wonder why. The pile of 8-bit computing stuff made for slow work, the nostalgic thrill soon dulled by the dense irrelevance of almost all of it. But I found what I was looking for. A flaked and yellow clipping from The Surrey Comet depicted a teen-aged boy, hunched over a CPC in a small room, his face in profile and partly in shadow. On the monitor ran the game, scrolled halfway up with what looked like code underneath it. 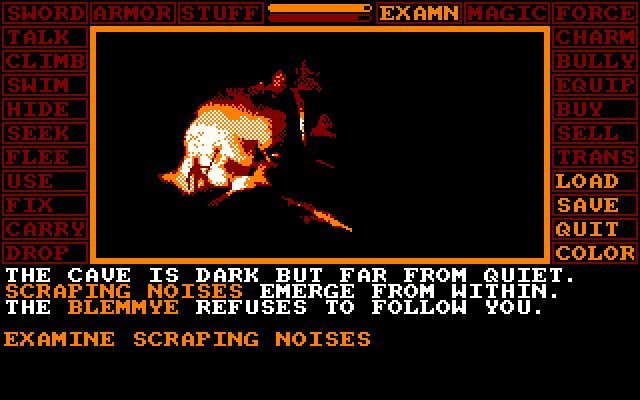 The text pushed the scene line by line off the top of the screen. 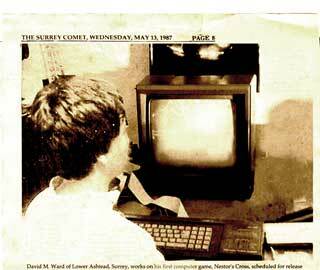 The photo caption read "David M. Ward of Lower Ashtead works on his first computer game, Nestor's Cross, scheduled for release later this year by Golden Games. Only 15 years old, Ward has been programming since he was twelve." I slept well for the first time in a while. "We don't know what to do. It's not that it's sudden, it just seems ... so unfair." A faint echo on the line made Heather's voice seem even more distant. Her father's cancer was successfully removed, but it had already moved to the liver. On the scans, there was a dark shape; in surgery, it was found to be on the hepatic artery and thus inoperable. "Does he, you know, have long?" "The doctor said he should go home and enjoy what's left." I said nothing for a long while. Then, "I love you." "We're going to get a second opinion." 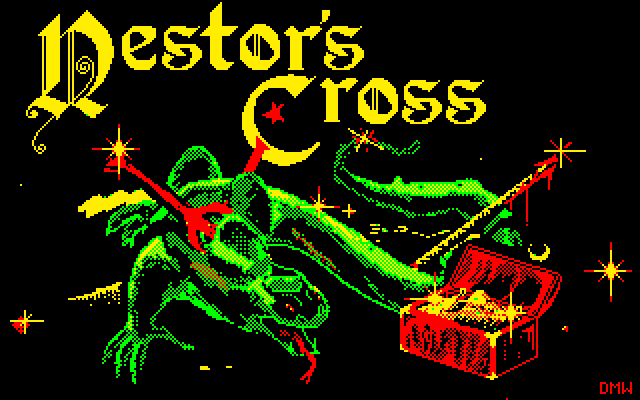 Back on the 'net, there were no references to any game called "Nestor's Cross" to be found, but that was no longer a surprise. Ashtead, of course, was still in Surrey county, England. The phone directory offered nothing for anyone called Ward or the business. A trip to the college library got me the publisher's old address, a P.O. Box in nearby Leatherhead, from a late-80s business directory. The Leatherhead and District Chamber of Commerce didn't know a thing about it. I read up on the Nestorians, but it offered no hints, of course, about the author. Armed with the name of the game, its programmer, and the publisher, however, I returned to the boards. "This is in issue 3 of CPC attack. perhaps your man? Q: What happened to programming prodigy David Ward? A: No idea. A preview of his first game was sent to mags, but we never saw it on the shelves and never heard from him again. Sometimes, that's how the chips fall. 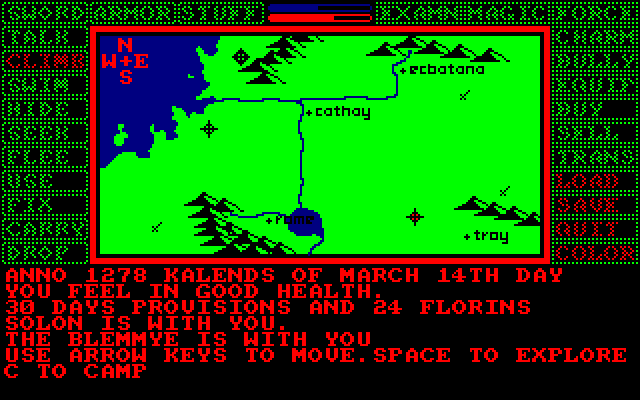 Maybe the kids at Amstrad Action know more." Yes, I see your emails on the amstrad page. Well done. You figured out something about that old thing. Good for you. We never even sent it out to the duplicators, so I have no idea how you got one. But you know what. It's none of your business. This was nearly 15 years ago now and its all put to rest. " "This is Simon Ward. I'm Mike's dad. I set up the company to publish his game but it was never done. Happy now? Why are you so interested??? This was years and years ago. If you know what's good for you leave it alone." I stared at it. Everything in it seemed to imply a dozen possibilities, beginning at weird and going downhill. For me, though, the key was in just one word: "Mike." David, then, wasn't the name he used. Right there in his dad's anger--and right there in the electoral register--that middlie initial stared me in the face. They now lived in Epsom, just a couple of miles from the town he grew up in. Baerely an hour away from me. Just one change on the trains at West Croydon. If I just wanted an answer to my questions about the game, I could have written a letter. But instant gratification has ways to make you move. Besides, it's easy to follow whispers of the problems in other people's lives. So I stood up, left the flat, and went there. Ward lived just off the A24 near Epsom General, in a long row of ground-level flats flanked by well-kept lawns. Whitewashed cement blocks, designed to stop cars mounting the pavement, lined the street. Wheelchair ramps led to every door. An old couple peered out from their home. It took me a long time to find Ward's place, as the number had fallen off the door; I knocked on his next-door neighbor's by mistake at first. The elderly woman within cast me a vicious look. Finally certain of his address, I rang the bell. Inside, tinny 1980s pop music approached, as if from headphones turned up too high. It stopped with a loud mechanical click. The door opened wide. A sunken replica of the teenager from the photograph lingered behind it. Ward looked at my chest, without saying hello and without meeting my eyes. In his left hand was an old yellow walkman. A cord coiled tight from it around one of his fingers, then up to the headphones. "Hi... Mike," I said, embarrassed. An ingratiating smile formed on my lips. "I'm a fan of your game. I'm really sorry to bother you, I know this is a bit weird, but is it poss..."
My voice trailed off. He still didn't meet my gaze. His face, his eyes, his bottom lip were slack, as if he were deaf, or not aware of what I said. "What happens in the last scene?" I persisted. "The copy I had--you can't get past the gate! Why did you make it impossible to get to the chapel?" I asked a few more questions, but nothing even seemed to register. An uncomfortable silence descended. Frustrated, I ducked a little, tried to catch his attention with a wave of my hand. He swayed a little, nodded subtly and compulsively in a way that normal people do not. "David," I said again, little more than a whisper. "What happened to you?" Heather's father died in 2002, after it metastasized again. They opened him up one last time to find his stomach covered in thousands of tiny mutations. She and her father had reconnected in his final months. At the end, everyone was there. By then, I'd long since graduated and joined them in New Mexico. But in the hospital room, I still felt like an interloper, hovering on the periphery as Raiman's wife and daughters shared his last moments. Painkillers had already taken everything except his breath, leaving only the slowing murmurs and the memories. Memories. The air was thick with their power, as if this was the moment when they truly mattered, their recitation the guarantee of an afterlife. When he died, silence took them. I helped an orderly move him off the bed and onto a gurney. In the months and years after Raiman's death, those shared recollections, so precisely defined at the end, slipped away. Whatever remained of the past became a different thing in each of those who knew him. Only when something is gone for good can it exist in many places. A chorus of many voices singing apart, each with its own cherished moments, its own strange and insidious regrets. "Do you remember that stupid old game you were obsessed with?" Heather said, years later. "It's a bit like that. The more you think about it, the more you make up in your head. And eventually, you can't even remember what you loved the most." No sooner had Ward met my eyes than he closed the door. Surprised, my nose inches from the wood, I heard the music start up again. The squeak of tires and a shout rattled out behind me, and I turned to to see a middle-aged man haul himself out of a Land Rover in the car park opposite the main road. He wore a waxed coat. His face was red with anger; he yelled something at me. Traffic blocked his way. I heard the door click open again and a hard edge pressed into the palm of my hand. I turned back. David Michael Ward looked at me. An odd expression crossed his face for the briefest moment as the door shut again. Then he was gone. He'd given me a cassette tape. Written on it was "80s CLASSICS / MADONNA." I gaped at the absurdity of it. "You're that fellow off the computer, aren't you?" the red-faced man shouted. He closed in. Ward's father, I guessed. "Just who the hell do you think you are? Leave him alone. Just leave him alone. He doesn't need anything from you." I backed off. He moved between me and the door. A grey fuzz of fair hair lingered around his temples. It was all I could do to mumble apologies over and over again. "Satisfied?" he said. "What do you care about that stupid game?" "He didn't... I'm sorry, I didn't mean to... I didn't know." "Just get lost before I call the ..." he said, his voice a baleful whine. Something in it was not quite right. A note of anxiety emanated from the word he did not say. "You people should spend less time in front of a bloody screen and more time ... reading real things." I shuffled away and tried not to look back. As I turned a high-hedged corner, Ward's dad unlocked and opened the door. Curiosity lingered despite my guilt and embarrassment. On the way home, I examined the tape. A Maxell C60, it was ancient and well-worn, the trim of its faded label a pale and pencil-scored blue. As soon as I ducked into my flat, I threw it into the stereo and hit play. Just in case. Madonna. Lucky Star and Borderline, Burning Up and I Know It. A clunk at the end of side A as the player reversed itself. And there it was on the other side, the datastream. An even lead-in at 1,000 baud, followed by a shrill lick at 2,000. I pressed stop as soon as I heard it, then sat in the silence of my room. The game. A copy given to me by its author. Not the one that got into the wild, the broken one that couldn't be finished -- the original. What did the father think, I wondered, when he realized his son had locked the world out of its final scene? All that work, and no public release? It made no sense. Three days later, I was back at my parents' house. Amid the attic's dark clutter, I found the Amstrad's box, torn white creases wandering across the glossy black cardboard. I hauled it down the ladder. Within was the 20-year old machine; out it came, my reflection distant and gray in the CRT. The cassette tape slid in. RUN. Data screeched. And within an hour or two, the Garden of Cyrus loomed. I faced the gate. "This place yields only to the bearer's name. Speak!" it said. The answer was always abundantly clear from clues spread throughout the game, which was steeped in medieval mythology. You are Prester John, king of the fabled Christian east. That answer never worked, though, back then -- those advance copies were evidently incomplete or locked, the final scene inaccessible. With a feeling of infinite triumph, my fingers set across the keys. I had a complete copy, handed to me by its own author: whetever Ward's secret was, he wanted me to know it. I tried again. The same reply--the same as it always was: "Nothing happens." PRESTER. JOHN. KING JOHN. JOHN PRESTER. I must have entered each a hundred times as a kid. THE BEARER. Nothing. It was just as broken as the one I remembered. Progress was impossible. Enraged, I slapped open the Amstrad's deck and flung the tape at the wall. It cracked off the brick and fell in halves onto my old bedroom's floor. Dark tape rolled across the carpet, led by a white plastic cog. For a long while I glared at the remains, at the plastic casing and its sun-bleached label. I blinked, then laughed. All along, I'd recited the answer I remembered, rather than the one I was asked for. The one I could never have figured out as a child. I swung back to the Amstrad. The game was still running--lacking a cartridge's built-in hardware, tape software must spool into the system memory before it can execute. The bearer of Christ. My screen faded as fast as a Zilog Z80 permits. A new scene formed, and years of wonder faded. I was in a tiny dark church, bathed in color from stained glass windows. A book rested on a lectern, the chamber's only furnishing. What had that strange, broken boy placed there? I don't recall what I'd expected, exactly, except something awful, a cipher for the unspeakable, something in his life he could not bring himself to express in plain words. That was why his father never published it--and why he was so angry at my interest. Every circumstance seemed to focus on that point. Ward knew, at the end, that a puzzle solves nothing for its creator: it just mirrors what it conceals. A mystery might seem a safe place to store evil, but it isn't. It can't be. But I was wrong, of course. There was no tangled diary, no dark answer to David Michael Ward's predicament. As I selected the icons for EXAMINE and BOOK, I saw that all of these enigmas were imagined. It dawned on me that nothing was ever missing from the version I'd found and played back in the 1980s; then as now, I simply hadn't figured out the answer. Ward had simply made obvious to me what was obvious to most: damaged as he is, his final look at me had been a smile, full of knowing. The game ended with just a single word. At first, today, I was tempted to remember it otherwise, for effect. But that would be cheating.